Bees are the major pollinators of crop plants, and so their decline has become a major cause for concern. Many factors responsible for this decline have been identified, such as loss of habitat, use of pesticides, and non-availability of food. A new study, published in Journal of Applied Ecology, explored whether young bees (called “larva” in scientific parlance) required a diet plan, which differed from that of the adults. Could it be that they needed high-quality food, rich in non-sugar compounds, to grow into strong healthy adults? And did this mean that the seed mixes created by agriculturists and the environmentalists to grow bee-friendly plants actually was not offering a menu friendly to the young bees? Most efforts to grow bee-friendly plants have concentrated on catering to the needs of the adult bees. This means “bee-friendly plants” are chosen based on the quantity of nectar and pollen produced by them and how frequently they are visited by the adult insects that feed on nectar. What impact does this have on the bees? Well, it seems the bees have been offered the equivalent of “junk food,” high in energy that might suit the adult bee but is nutritionally unbalanced in terms of baby bee (larval) food, which is actually the pollen. Is it not true that the same 26 alphabets in English could be used to make many different words? So too, some basic elements such as carbon, nitrogen, potassium are used in different proportions and combinations to produce the different compounds required by an organism for development. The proportion in which the atoms of these elements are present in the compounds is known as stoichiometry. It turned out that the wild bee is particularly in need of nine atoms: phosphorous, sodium, manganese, magnesium, potassium, iron, calcium, zinc and copper. And, naturally, composition of pollen varies from plant to plant. But then, one atom cannot be transformed into another nor be synthesized in the body. So, if one or some of these elements were scarce in the pollen collected by the mother bee, the bodies of the developing larvae may be defective. 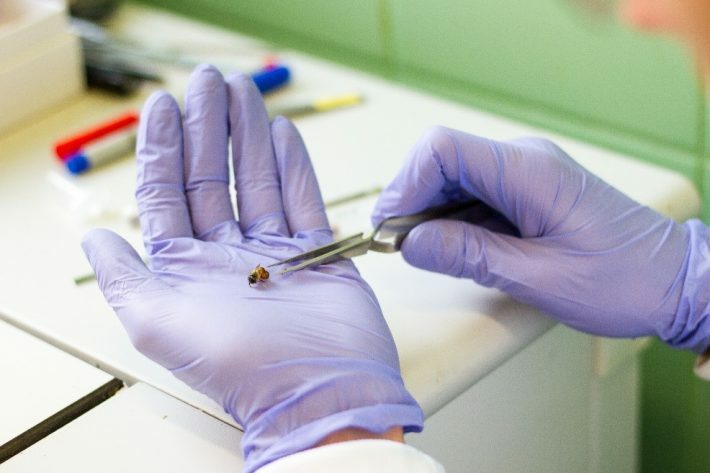 This phenomenon where the ratio of atoms in adult bee body does not match that in the larval food is called a “stoichiometric mismatch” and it can negatively affect health and fitness of the bee. What does this mean? Let’s imagine there’s Plant A and Plant B. Pollen A is rich in phosphorous, but lacking in sodium and the converse is true for Pollen B. Thus, collecting pollen from only one plant would negatively impact the larva’s growth and development; however, combining pollen from both plants gives it a balanced meal. “So, we should stop thinking about ‘bee-friendliness’ of plants in terms of how much nectar and pollen they produce, but rather in terms of how high their quality is,” says Filipiak. In this study, Filipiak used ecological stoichiometry, a quite new and developing area of environmental biology, to compare the nutritional “demand” of wild bee larvae with the “supply” of nutrients in the pollen produced by native, alien, and garden plants and crop species. It turned out that many plant species, including crops and so called “bee-friendly plants” offer inadequate supply of nutrients in their pollens. However, not much of a mismatch was present between the nutrition in the pollen supplied by the mother bee to the larvae and that required by them for development. Two theories could serve as explanations: 1) the mother bees selectively collected pollen from specific plants that provided the necessary balance required in the food of the larvae or 2) the bees grew only where the plants provided healthy baby bee food. This would mean bees can prosper and thrive only in places where plants offered pollen with the nutritional balance required by the bees. In this study, lavender, rapeseed, sunflower, thistles and dandelion were indicated as plants producing pollen of poor quality, whereas wild clover, broad bean, blackberry, walnut and some willow species pollens are complete food for the baby bees. In conclusion, conservation strategies, such as the use of flower strips and hedgerows, should ensure to have key host plants for bees that offer pollen rich in nutrients, which help in proper growth of the larvae. Also, producers of seed mixes should consider preparing these from plants producing pollen that are balanced nutritionally for wild bee larvae. The study was in part financed by the National Science Centre, Poland (Grant No. 2016/21/B/NZ8/00318).